This is something I’ve been waiting months for, but it is such a weird concept for it to finally be here. People–and by people I literally mean everyone: family, friends, co-workers, strangers– would constantly ask me one question first: “Are you nervous yet?” And despite the time already coming and going, I can honestly say at no point was I ever nervous to be here. Over the past couple of days I’ve certainly had moments where I’ve felt unsure of the moment, or felt uncomfortable about sitting next to someone who’s sharing the same experience as me but ultimately someone I would never see again, but I never once felt weird about finally being back in Japan. I definitely wasn’t ready for the path I would take, didn’t prepare to the extent I should have, and procrastinated to the point that it’s uncanny I was able to get on a plane out here without fate stopping me and telling me to head back. Nevertheless, I made it to Japan, albeit am still a bit away from my final destination. I feel a bit like I’m walking in an unreality. It’s hard, since in the past week I’ve spent more than 24 hours in transit, and another 24+ working inside hotels. Slowly I’m working my way towards the life that will be my life for at least (or most) the next year, and I guess the start of this blog is a good distinction to the end of my transition. At this point I may just want more to be able to wear whatever I want without having to dig to the bottom of my suitcase and repack my bags everyday, but I think truly I’m ready to unwind. Fukui prefecture seems to hold itself up to its reputation of the happiest life in Japan, and I hope I can do it justice as I keep track of what goes on in my life. Tomorrow I’ll be heading to the city where I’ll be permanently based (though temporarily without an apartment, and indefinitely without a bed), and I suppose then I’ll finally be ready for it all. No matter what happens, I have to remind myself of what I was left with just a week ago. Almost incredibly I moved out of my Northfield aprtment of ten months, flew to Fargo and Boston, and spent a week without sleeping in my own bed. In fact, since leaving my apartment I didn’t actually get a real nights rest and that may be one of the things later on that I regret most. To the point though, I started off the night before I left with my room (and my life) in the truest sense of bedlam. 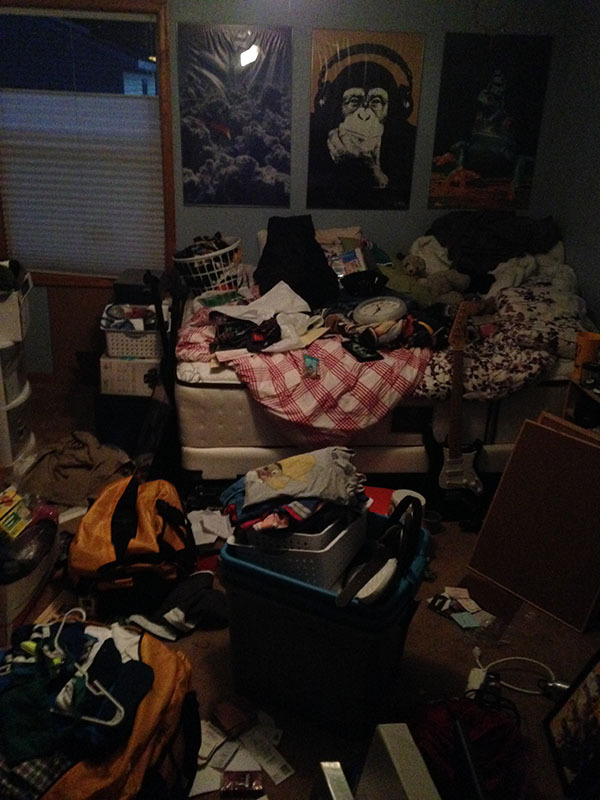 Through the night I didn’t panic–well, barely at most– and was able to tidy it up by the time the morning came. Truly, the fact that I took the room in this picture from shambles to liveable gives me at least some security going into whatever chaos becomes this next future. Posted in JET, Planning, Travel.